The wait for local foodies has been long and anxious. Nearly a year after Café Corazon, a wildly popular fresh-and-local Mexican restaurant in Riverwest, announced they would be opening a second outpost on bustling Kinnickinnic Avenue in Bay View, opening day finally arrived in mid-February. Corazon means “heart,” or a term of endearment, in Spanish and that’s exactly how this cozy little spot feels. While the Riverwest location is on a small hill and boasts a garden environment, the Bay View eatery flaunts an urban vibe. Car traffic hums along KK Avenue and the sidewalk out front is a throng of joggers, dog walkers and locals doing errands on foot. 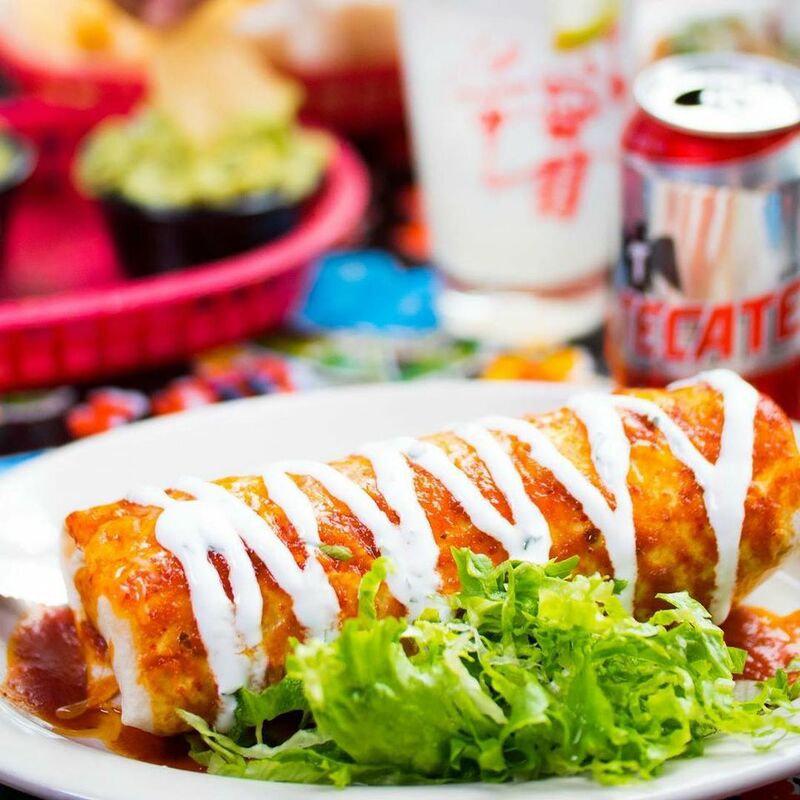 It’s a refreshing alternative to the half a dozen Mexican restaurants in the area where the food is decent and cheap, but the atmosphere and quality of ingredients lacking. The restaurant is divided into two sections. You enter on the bar side, and beyond that is the dining room where cherry-red metal chairs are matched with small wooden tables and booths with blue cushions. Wide vertical planks of wood make up half of each wall. Decorating the walls are religious artifacts with a Latin bent such as glass Mexican prayer candles on little wooden shelves, portraits of Jesus, crosses, and religious medallions and tapestries. Even if you aren’t religious or have a personal connection to the items, they translate as a sense of place and also provide color and art. Every day at Café Corazon there is a special and on the day of my visit—Thursday—this translated to a buck off vegan entrees. (Other specials include $2 tacos and $5 margaritas on Tuesdays.) Whether it’s relying upon herb tofu, soy chorizo or sautéed vegetables, a meal at Café Corazon doesn’t have to revolve around entrees created from meat or fish (here, you get to choose from seven choices: asada, which is grilled beef; carnitas, braised and tender pork; chicken; chorizo; ground beef; mechada, shredded beef; or shrimp). The back page of the menu is devoted to five vegan dishes. Inspired, I sprung for the Vegan Taco Plate, a veritable sampler of three corn tacos that allows you to test-drive the meatless options, topped with lime-cumin vinaigrette. My companion opted for the carnitas enchiladas, which fold in pork. For both dishes, the presentation was very colorful and travels many steps beyond what you’d expect at a taqueria. And there are some surprising inclusions, like mussels in spicy white wine with a choice of shrimp, chorizo or soy chorizo, and jalapenos, too; and three hearty meat-free salads with an option to add on shrimp to one of them, the signature Corazon Ensalada, a medley of mixed greens, rice, beans, tomato, crema and avocado, plus either black or pinto beans and topped with chipotle-seasoned ranch dressing. There’s also a nod throughout the menu to local producers, such as Simple Soyman’s tofu and—in my horchata, which is a Latin drink of rice, milk, cinnamon and vanilla, Sassy Cow Creamery in Columbus. In fact, owners Wendy and Jorge Mireles cull a lot of the menu’s ingredients from their family’s farm. In a rare move, Café Corazon is open for Saturday and Sunday brunch while most restaurants opt only for Sunday brunch. There are five different breakfast tacos, two breakfast burritos and a selection of empanadas that fold in ingredients like Wisconsin crimini mushrooms and Wilson Farm’s shredded pork, from Elkhorn. Even the burger topped with jalapenos, bacon, cheddar and cilantro sports local roots; it’s from the owners' family farm in Waupun called Richway Acres. It’s also served with a side of fruit, rice and beans, or papas a lo pobre (thinly sliced potatoes cooked with onions and green peppers). Traditional breakfast orders like pancakes and French toast are available, but with a twist, such as the French toast soaked in rumchata or Jolly Cakes, which are drunken amaretto pancakes. Beverages at Café Corazon run the gamut, from innovative cocktails (like “Adam & Steve,” with Korbel, passion-fruit juice and Bombay Sapphire) to drink staples (like sangria made in-house to my companion’s Mezcal Margarita on the rocks, crafted from Del Maguey Vida mezcal, lime juice, triple sec and simple syrup, resulting in a nice smoky flavor). Non-alcoholic drinks with odes to Mexico include horchata as well as bottles of Mexican Coca-Cola.